Raising the minimum wage, or the existence of a minimum wage at all, is one of those topics that nearly everyone you meet will have some opinion on. Some will argue that raising the minimum wage will cost jobs because employers won’t be able to employ the same number of persons at a higher salary. Others might argue that raising the minimum wage is necessary since even full time employment in a minimum wage job usually still leaves a person below the poverty threshold. With so many conflicting ideas and arguments, it can be difficult to decipher the issues and to separate the data from the rhetoric. However, when armed with the facts, you too can navigate this issue. So what exactly is minimum wage, and when does it apply? The minimum wage can roughly be defined as the minimum amount required by law that an employer must pay its employees per hour of work. Both the federal government and states have the ability to set a minimum wage, but the federal minimum wage serves as a floor for state minimum wage laws. That is to say that the minimum wages set by the state must be higher than the federal minimum wage in order for them to apply, otherwise, the federal minimum wage supersedes. The Federal minimum wage applies to any employment covered by the Fair Labor Standards Act. The Fair Labor Standards Act, enacted in 1938, introduced the federal minimum wage, provided limitations on child labor and created the forty hour work week. The legislation emerged during the Great Depression as part of the New Deal, and applies to most employees by virtue of the commerce clause in the United States Constitution. However, exceptions do exist for small farm-workers and ‘white collar’ workers (executives and professional employees) who are paid on a salary basis. What are the minimum wages in the U.S.? The current federal minimum wage is $7.25 per hour. 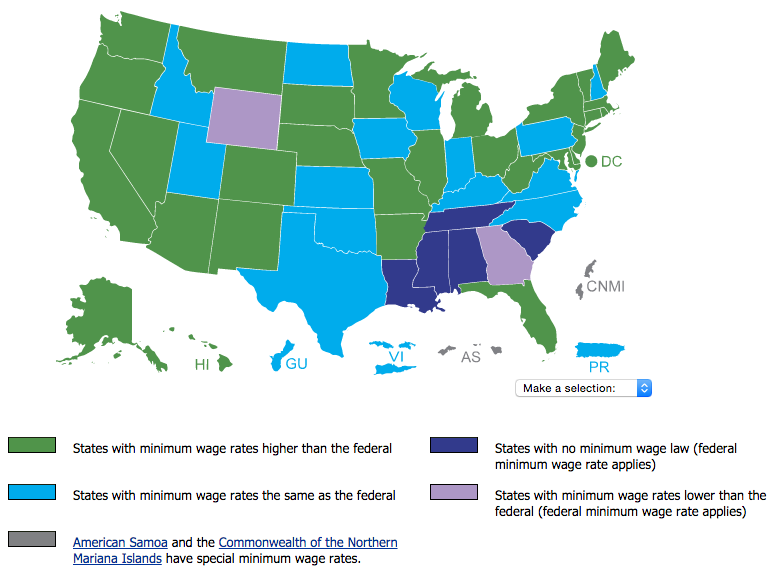 Georgia and Wyoming are the only two states with minimum wage rates below the federal rate. Georgia’s minimum wage is $5.15, which means that, except for in some limited circumstances, the federal minimum wage overrides it. The history of minimum wage changes. According to the Department of Labor, the federal minimum wage has changed 22 times since 1938, from an original rate of $0.25 per hour, to the current rate of $7.25 per hour. Georgia’s first state minimum wage was introduced in 1972 at a rate of $1.25 per hour, and over time, the wage has remained consistently at or below the federal minimum wage. Just looking at numbers does not give us a full picture of the actual history of the minimum wage through the years. Inflation measures the buying power of a dollar as time passes functionally meaning that a dollar today is worth less than a dollar ten years ago. When the historical minimum wage rates are adjusted for inflation, one can see that the current minimum wage is worth less than the minimum wage of thirty years ago. Why should the minimum wage be increased? Over the years, inflation has increased more rapidly than the minimum wage. The minimum wage was only $3.35 per hour in 1981, which seems small compared to today’s $7.25. However, the dollar is worth less today than it was thirty years ago. The minimum wage of today would need to be over $8.00 to match the purchasing power of the minimum wage in the early 1980s. The minimum wage is lower every single year in terms of buying power as inflation rises. To fight this, Oregon and Washington have elected to adjust their state minimum wage for inflation annually with a policy tool called indexing. The minimum wage is similar the concept of a “living wage“, the idea that business have an interest in paying all of their workers enough to reasonably sustain themselves on their earnings. As inflation has risen and the minimum wage hasn’t, families are having an increasingly difficult time simply getting by despite working full-time. Why shouldn’t the minimum wage be increased? The primary argument that the minimum wage should not be increased is that it could hurt employment. Basic economics suggests that an increase in the minimum wage will result in a decrease in the supply a minimum wage jobs, adversely affecting employees seeking these jobs. However, more in-depth economic analysis paints a more diverse picture. Another argument against a minimum wage increases is that it will result in higher prices. If employers maintain the same number of employees but are required to increase their wages, they will need to charge more for their products to maintain their current profit margin. This will, in turn, decrease the purchasing power of the dollar, increase inflation, and create a cycle of wage and price increases. The United States Department of Labor states that about 53 percent of minimum wage earners are full-time workers. Minimum wage earners contributed 46 percent of household wage and salary income in 2011. Of those who would benefit from a federal minimum wage increase, 88 percent are above the age of 20, and 55 percent are women. Increasing the federal minimum wage would boost the earnings of 28 million low-wage earners nationwide. Further, the Department of Labor has found that a review of 64 studies on minimum wage increases found no discernable effect on employment. More than 600 economists, seven of them Nobel Prize winners in economics, have called for an increase in the minimum wage to $10.10 by 2016. Projections also do not indicate that minimum wage increases harm the economy. Over time, Gross Domestic Product, a measure of economic growth, has steadily increased even when minimum wage has been raised. In percent terms, GDP is not affected by increases in the minimum wage. California provides a real-world example of these statistics. Employers in the state are required to pay their servers the full minimum wage of $9.00 per hour before tips; however, despite a recent increase in the minimum wage, the National Restaurant Association projected that California restaurant sales would outpace the United States average in 2014. The argument for raising the minimum wage is a compelling one and studies tend to indicate that raising the minimum wage can help the economy without hurting employment. In addition, a minimum wage increase would provide a raise to nearly 1 million Georgia workers, of which 92 percent are over 20 and 25 percent are parents. Like many of Georgia’s tax credits, raising the minimum wage would result in 2,900 new jobs over the next three years and pump $812 million into our state’s economy. As the legislature continues through the 2015 session, a raise for Georgia’s workers most in need should be considered as a part of a policy approach that supports a strong future for Georgia’s workforce.